I grabbed this 1973 Topps Mike Schmidt / Ron Cey #615 rookie card because eBay had a January $15 off promo code with purchases of $75 or more - I'm a sucker for those promo codes because it gives me an excuse to look for cards to add, even if the apparent discount isn't all that much for what I need to spend. 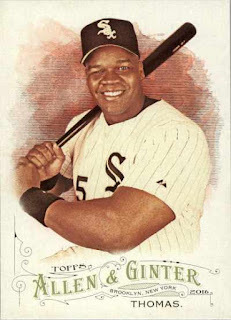 As a more substantial long-term project, I've tried to focus into finding PC cards that I hope will make my overall collections a bit more well-rounded - even if the cards feature more of the old-timers, rather than the latest and greatest players from the past five years. 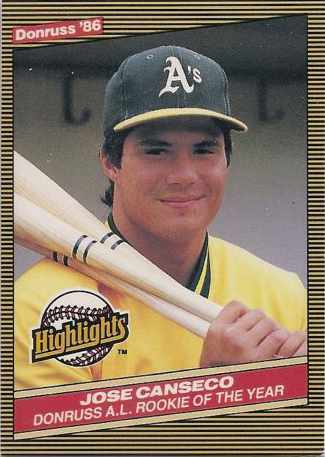 The idea of owning the particular card was probably kind of foreign and strange to me - I assumed a raw, ungraded card was worth at least $200 at one point and it just wasn't realistic to grab one. 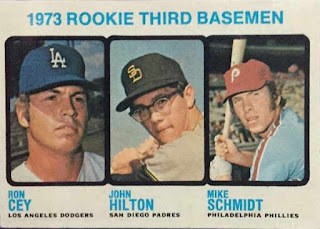 Obviously a Schmidt rookie card would be much more significant if he was the only one pictured on a 'stand alone' card - as is, maybe I just don't appreciate the quaintness of the centerpiece player [John David Hilton], who played in a full season of MLB games  spread over parts of 4 years and hit .213 with an OPS of .564. 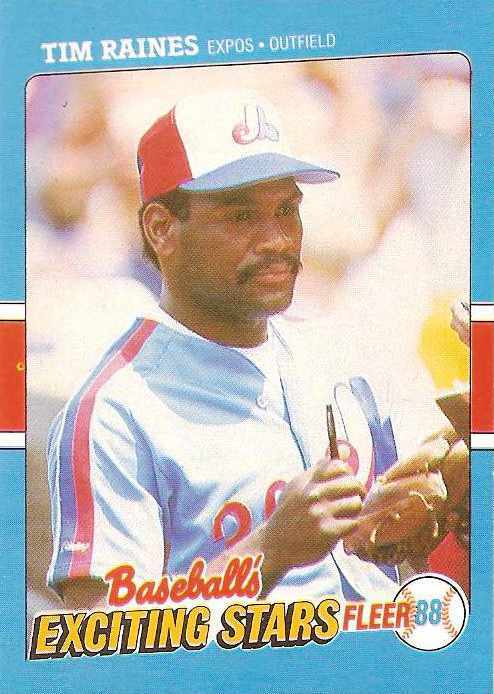 I want to say I mainly remember Cey roughly 25 years ago because he was pictured on ads posted in the sports page of my local paper - touting / endorsing some kind of get rich quick investment scheme with baseball cards. 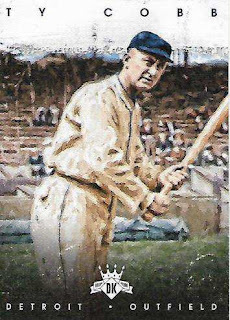 Schmidt is probably considered the best third baseman of all time though Cey was a fine player to be sharing this card with John David Hilton and Schmidt - I'm not sure if he was ever considered a national star back in his day, but Cey was a Dodgers slugging third baseman who finished his 17-year career with 316 home runs. 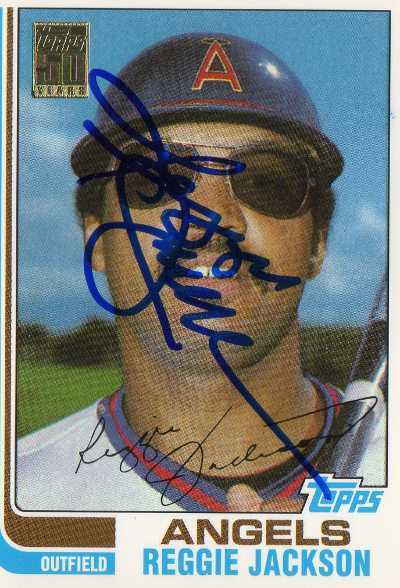 It's a thing where I want at least one autograph of players who've played for the Angels - as is, I've been content to collect loose autograph cards / items [TTM/in-person, certified and purchased] while not really putting them together in a tangible way. 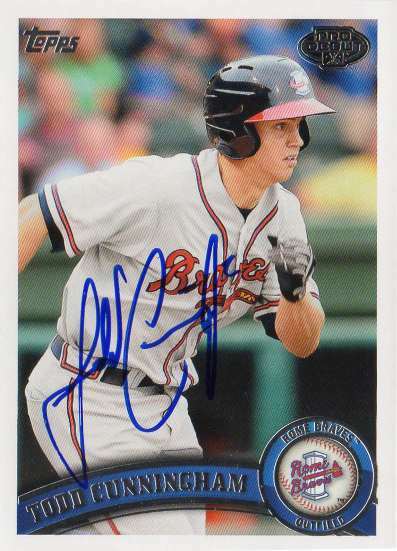 Just to get organized, I want to see if I can count out about 200 different autographs in-hand and list them out in a Google Sheets file I created - to straighten things out as far as knowing which players' autographs I already have, what kind of card, how it was picked up, etc. I'm not a completist when completion may not be realistic, though I wanted to settle on a numerical goal [of 200] - so at the very least there is something I can point to as far as a collection to build on. 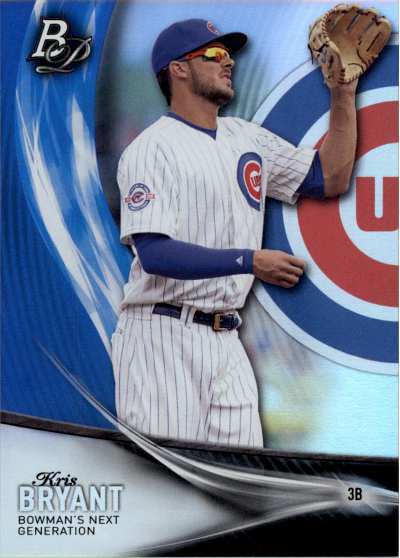 I read it somewhere that trading cards are the easiest to find and store in any sort of quantity - so baseball cards are usually what I've gotten for this collection. 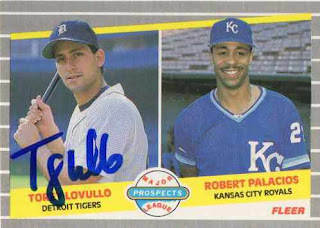 I'd like all the autographs on cards / non-card items for this collection to picture subjects as Angels, though that may not always be the case - as a way to make distinction, I've split the physical collection of signed cards between Angels cards and non-Angels cards. I still need to scrounge around for random autographs I might have - to account for various autographs still out in the wild. 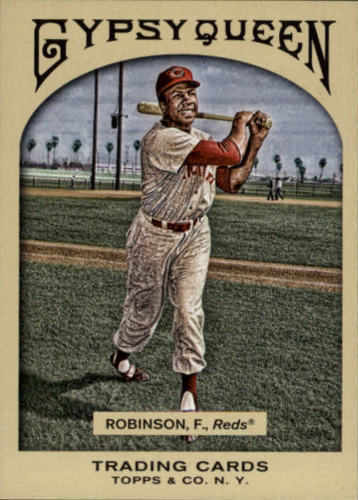 Over the years, there have been an endless archive of major league games posted on YouTube and for now, MLB has been sort of liberal as far as not flagging down the games not posted through their actual account - while the concept of watching archived games isn't new to me, maybe my attention span is much shorter than it was 25 years ago. 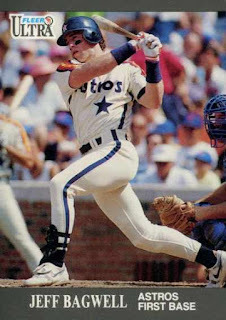 I could probably sit through a minute MLB highlight at best, rather than get lost watching significant parts of game - that has already happened and is otherwise ancient history. At the very least, I'm thankful for what the streaming video era has brought over the past 10-15 years - to help form a better idea of players I might have only read about and/or remind me how just good certain players were, besides just glancing at Baseball Reference and checking to see who had the biggest WAR. 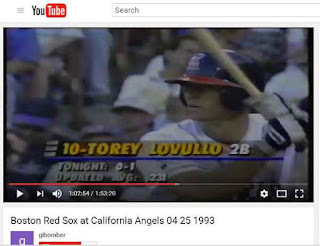 There is a ESPN Sunday Night Baseball broadcast of a game posted where Lovullo, a journeyman who played in parts of 8 seasons in the majors - hit a home run off Roger Clemens as an early season highlight in what would be a 91 loss season for the Halos. In the grand scheme of things, that home run means nothing except to Lovullo and perhaps his family - however, seeing the clip as a fan it helps me picture at least one neat thing this otherwise anonymous guy did as an Angels player. 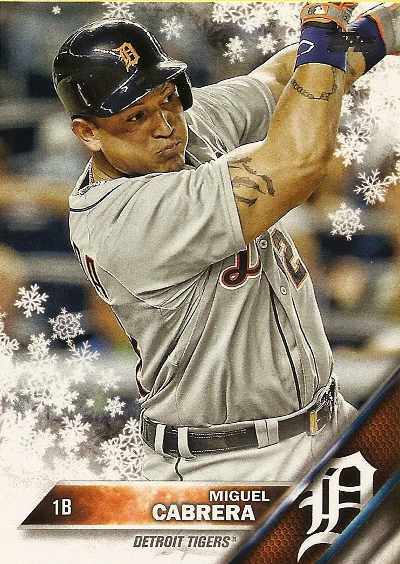 I'm not really excited about his signing, because I see Valbuena as a flawed player with an up-and-down big league career - if he hits around .250 instead of .220 with 15-20 home runs, then he's probably a useful piece. 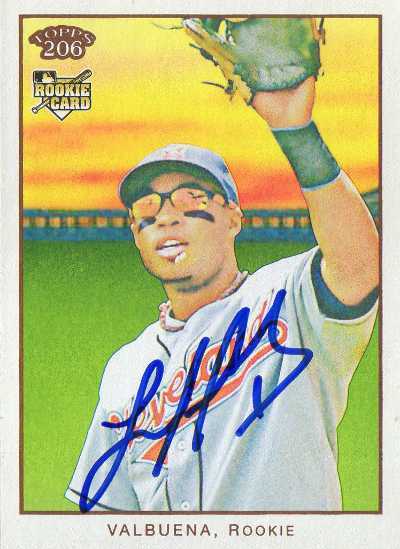 Once he plays in a regular season game for the Angels, I can add this signed card to my Angels all-time autograph collection - I probably got this autograph in-person when Valbuena played for the Cleveland Indians. Jeff Bagwell - regardless of the era Bagwell played in and the innuendo and actual drugs [Andro] he might have taken to be a dominant player or just to be able to play through a MLB season, Bagwell's election to the Hall of Fame validates his accomplishments as a major leaguer. I still have the key cards from the 1991 Fleer Ultra Update boxed set I bought when it was first released - featuring a rookie card of Bagwell, a rookie card of pitching phenom Juan Guzman, a key second-year card of Juan Gonzalez, a Mike Mussina rookie card and a rookie card of 19-year old catcher who came up with the Texas Rangers and possessed a rocket arm. 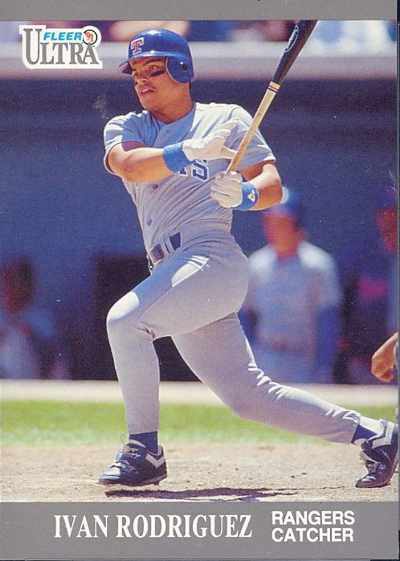 Ivan Rodriguez - of course the rocket armed kid from the 1991 Fleer Ultra Update set was Pudge and while there was always novelty in his ability to throw out runners, it was when he started to mature with the bat, did he really emerge as an impact player. Maybe Mike Piazza was the better catcher from the 1990s through the 2000s because of his gaudy hitting totals - but Rodriguez was a force behind the plate as a catcher and also when he stepped up to the plate. Tim Raines - I picked this 1981 Topps multi-player rookie card up for about $0.23 at a card show last year and with news he is going to Cooperstown, I'm glad to have it now. 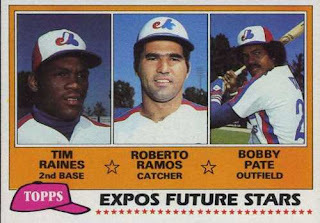 It seems like a lot has changed with the number crunchers since the last time I mentioned Raines - the re-evaluation of his numbers pushed him into the Hall in his last year of eligibility. 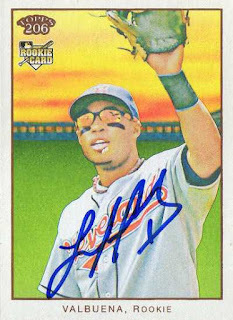 I was doing a random search on eBay and spotted an autographed 1962 Topps PSA/DNA blue flip 1962 Topps rookie card [sold by Baseball Card Exchange] - Chance’s autographs may not be hard to find but I wasn’t able to secure his autograph before he passed away in 2015. 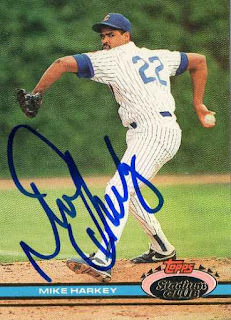 I was thinking of getting the RC as an impulsive, ‘scratch the itch’ purchase - so I don’t have to worry about not having an autograph of the former Angel who won the 1964 American League Cy Young Award. It looks like BBCE had at least several slabbed autographs of Chance in their eBay store and decided I’d rather have the autograph on a larger 1964 Topps Giants card - which looks a little prettier and where Chance’s shaky but still readable autograph doesn’t look as crammed in like the one on the regular sized card. 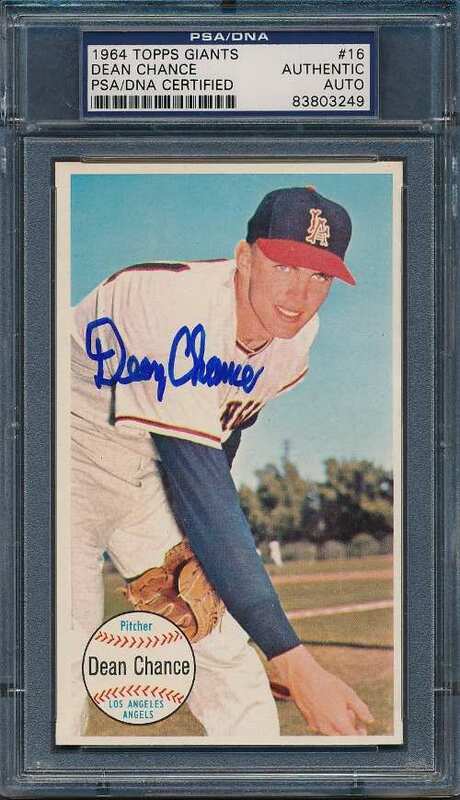 There is another eBay seller with 1964 Giants Chance auto cards [selling for $14.99 each] - but the ones sold by BBCE come already slabbed, so there is a little peace of mind as far as far as authentication goes. The Chance autograph will probably be triple counted as a signed card for my Angels all-time collection, for my award winners collection and finally for the regional component of my Top 50 common PC - as a side note, I’d like to really start putting TTM/IP autographs in my PCs, with the caveat they have to be PSA/DNA certified first. 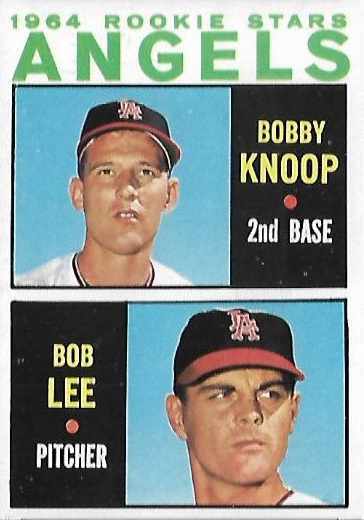 I'm trying to build up my regional personal collection bit-by-bit, so picked up a 1964 Topps Bobby Knoop / Bob Lee rookie card #502 - Knoop was a three-time Gold Glove Award winner as the Angels primary second baseman of the 1960s and was named to the Halos' Hall of Fame in 2013. 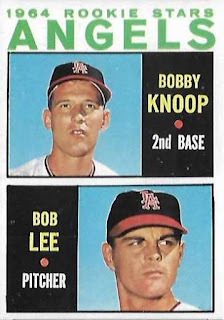 Maybe I didn't really pay as much attention to the bottom portion of the dual player card - but Lee pitched pretty well for three seasons [1964-1966] with the Angels from and was named to the 1965 All-Star team. In addition to the Knoop/Lee, I also picked up a 1961 Topps Tom Morgan #272 - this card isn't particularly notable, but will be part of a sampler run of Angels Topps old-school / vintage cards [1961-1980] I'm trying to put together, even if it is just adding a few cards here and there. Back when the team was still kicking, I might have casually followed the Fullerton / Orange County Flyers baseball team [of the independent Golden Baseball League] - I tried looking up one of the standout players [Rich Pohle] on the team to see if he'd had any history with a MLB organization [Pohle played in half a season with Ryan Howard on a Philadelphia Phillies short season A ball team in 2001]. 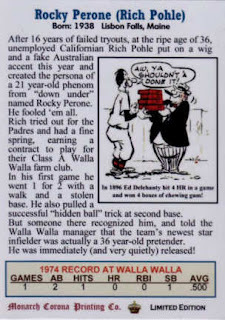 As is, I became vaguely aware of the story of his father, a ‘Rocky Perone,’ who was actually a one-time minor leaguer named Rich Pohle Sr. - the elder Pohle had a short, cursory stint as a professional ballplayer with an affiliated big league organization in the 1960s, but actually tried to make it back to the pros as a 36-year old disguised as a 21-year old Australian in the 1970s. 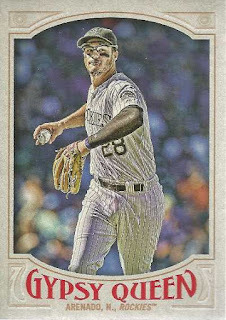 Pohle Sr.'s story got him some notoriety and if taken at face value, Pohle Sr.'s story wasn't an entirely unsavory tale - I’ve never heard of these Broder like, custom ‘home brewed style’ Monarch Corona cards, but I caved in and picked this one up. 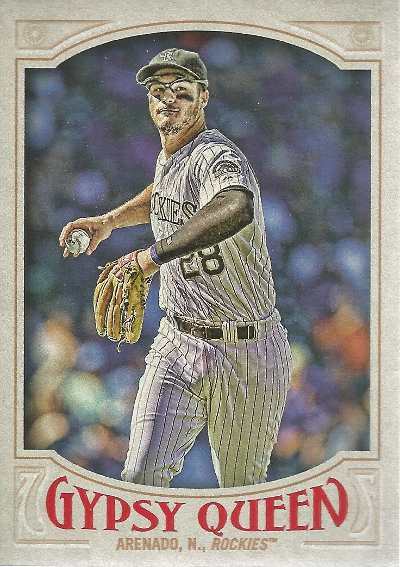 In addition to what I've started in previous years, I've tried to tend to the loose card projects that have sprouted up in 2016 - maybe these were the fun little, card related projects I could work on without having to worry about any apparent value. 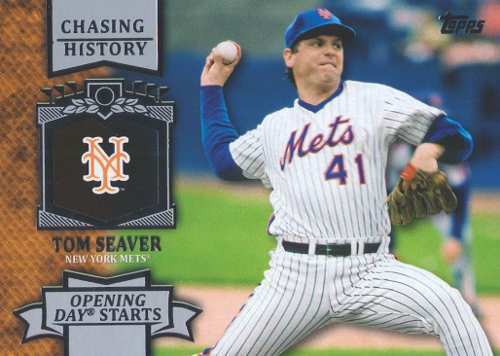 However, that lack of a value component may have made me feel like something wasn't quite there - as far as chasing any number of miscellaneous cards down. Collecting topics / mini-collections - I wanted to make this my centerpiece card project in 2016, but when it's all about having to scrutinize all sorts of cards, it kind of just mushroomed into busy work for me as opposed to being able taking the time to enjoy the actual cards under whatever mini-collection I listed them. I'd like to put away any cards I have into their permanent storage boxes as opposed to letting cards sit in what has become semi-permanent storage spots - I'm probably looking for that one or two mini-collection to store in a binder, so I can go through the cards. Award winners - I'm not worried about this project at all, though it would be nice to have this finished up through the current year. Angels frankenset - I started this in 2015, but seemed to put the project on hold in 2016, so I'm still looking to finish my first run [1-500] of cards. 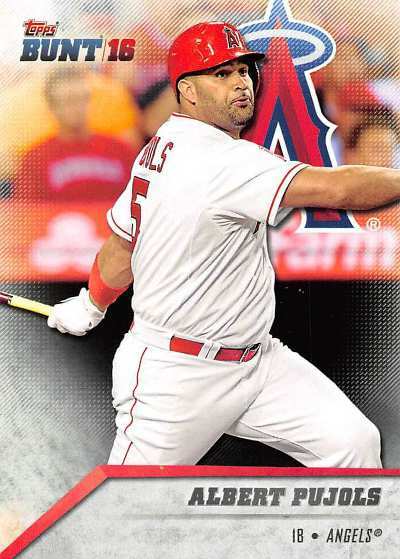 Angels Opening Day set - I started this in 2016 and looking to fill holes to complete more years. 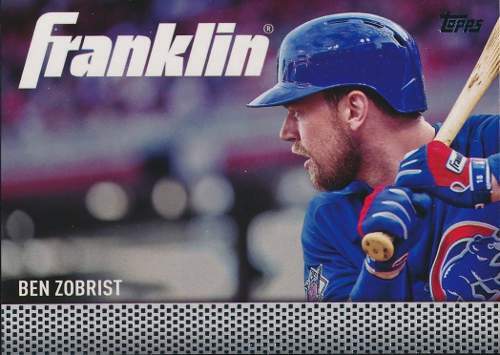 Hall of Famers - I impulsively started this project in 2016, though I may quietly put on hold or on hiatus, until I get a chance to add to the collection randomly. Milestone numbers [500 home runs/3000 hits/300 wins] - I'm going to see what I can add, but it really is just base cards and/or a basic insert. 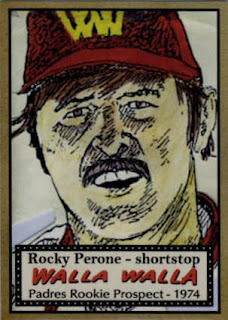 I want to pick things up 'organically' as opposed to having a checklist and seeking out cards I want for this project - this project is kind of out of sight, out of mind, though I'll probably come back to it at some undetermined point. Late in November, I went on a decade stars 'bender' where I sought to put cards of established players away in binders - since it's already been six years into this decade, I originally wanted to showcase cards featuring players who made their MLB debuts in the 2010s. However, I actually started with several players who made their debuts in 2000s - because I found a forgotten stash of 2000s debut guys' cards already in plastic pages. I ended up adding loose cards of the players already represented and then used up my remaining plastic sheets to house 5-10 more players’ cards - to showcase some of the basic star cards that have been boxed up. 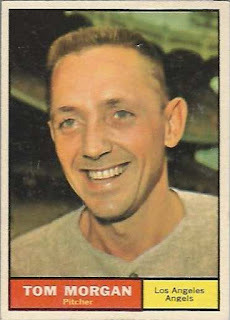 Pre-war players - a ‘catch all’ of players who made their debut before WWII; this is typically a collection for the retro cards I've found over the past 10 years, featuring the occasional Hall of Fame legends / icons. 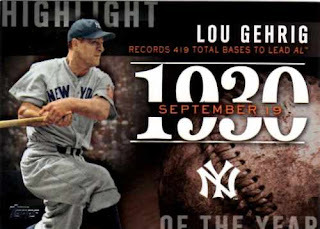 I don't really seek these cards out so I probably haven't hoarded enough cards for any one player - to be able to have a stand alone binder for each of the decades [players who made their debuts in the 1900s, 1910s, 1920s, 1930s and 1940s]. 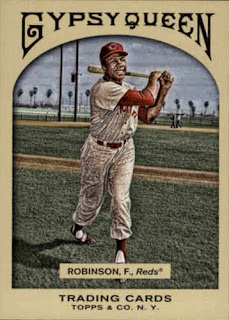 Postwar players - another ‘catch all’ binder of players who made their debut before 1980; maybe separated by 1950s-60s and 1970s. 1980s - strictly players who made their debut before 1990. 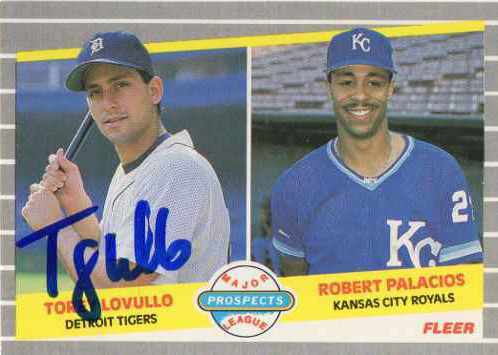 1990s - strictly players who made their debut before 2000. 2000s - strictly players who made their debut before 2010. 2010s - strictly players who made their debut before 2020. Regional - a wrinkle to my decade stars arrangement is having a book for a selected of prominent players from my team. I want to be proactive in adding selected players, especially if they are the younger, 'future stars,' though it may take awhile for me recognize veteran players who have flown under the radar like a Ben Zobrist - but maybe not all players are going to make it to a binder in my collection, though I'm going to leave them in a box that serves as the other part of a split storage of sorts for various notable players.